Lobsters Live: 1-1/4 lb. Live Lobsters shipped from Cape Cod overnight. 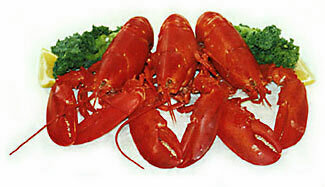 PRICE DOES NOT INCLUDE SHIPPING,which is determined based on number of lobsters ordered. All orders shipped by Fedex Priority Overnight. You may order any size lobster (up to 3 lbs.) and any number or quantity of live lobsters you want! Just drop us a line or give us a call!